Welcome back to Peeps Week... today we are going to make a Peeps totebag! First I made a pattern out of paper. It's a simple shape to cut out. I cut out a bunch of peep bunnies out of felt. This was the only tricky part... I sewed the peeps on with my sewing machine. I added some brown circle eyes and noses and it's done! OH MY GOODNESS!! That is too cute!! Andrea... can't wait to knit with you Monday... I'm free all day. Call me when you get here. 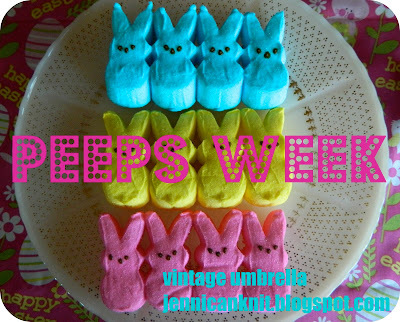 I am loving PEEPS week. Should be called 101 things to do with my peeps. I cannot eat the candy, but truly love this little bag. The Peeps Bag is darling, so creative. Happy Pink Sat. awwww this is adorable! Love it!